I took a lovely walk this morning. If I had thought of it, I would have brought my camera. But I didn’t…so you’ll just have to take my word for it that it was a lovely jaunt on a fall morning. 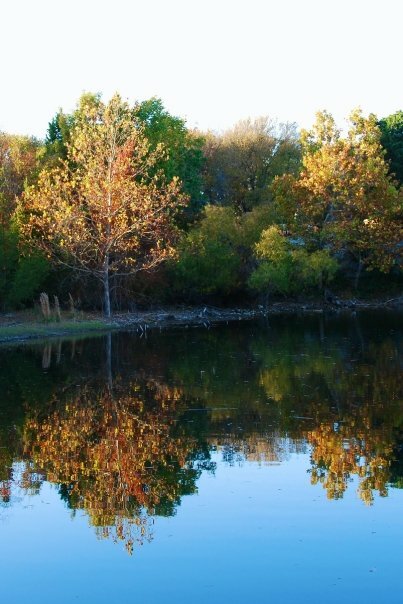 However, in honor of the first day of fall, here’s a picture of a pond near my home that we took several years ago. Even a camera could not have captured the feeling of the breeze buffeting my face and hair. There is a hint of power in a fresh, fall breeze — one that portends cold snaps and frost on the windows in just a little while. Today I’ve been a bit fixated on the word power because I came across it in my New Testament reading. Yesterday I was in a huge funk and decided I needed to spend some time reading me some Jesus. This special lady in history had a harder life than I can possibly imagine. Back in those days, a woman was “unclean” when she had her monthly cycle. Just touching a woman who had her period would transfer “ceremonial uncleanness” to the person who touched her. So this woman wasn’t just dealing with excessive bleeding, fatigue, and probably pain. She also suffered from loneliness. If she was married, her husband and her children were not allowed to touch her, to embrace her. For twelve long years. I feel a kinship with the bleeding lady because, like me, she “spent all she had” on physicians whose treatments made her worse, not better. I had that experience with massage therapy making me miserable. Hormones in various forms made me ill and did nothing to help my issues. The (expensive) VECTTOR device that I use for pain management hasn’t yet healed me in the eleven months I’ve used it. Like the woman in this passage, I, too, am at the end of my rope. I can just feel her hope welling up as she heard about the multitudes of people who had been healed by the touch of Jesus’ hands. From driving out demons (curing schizophrenia?) and restoring the paralyzed, to healing the leper — the worst of the worst in their eyes — Jesus wielded power even unbelievers could see. This was back in the day before special effects and computer-generated graphics. Real people like you and me were completely and totally healed. I imagine that this bleeding woman saw Jesus as her last — and best — hope. But her very illness caused a problem. If she asked him to touch her, she’d be transferring her uncleanness to him. 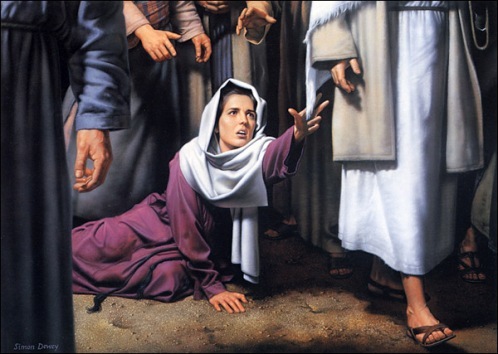 If the disciples knew of her affliction, would they even let her approach him? So she decided that she didn’t need to trouble him with a face to face request for healing. Somehow she became convinced that if she just touched his robe, she’d be healed. That would be like me believing that if I touched my doctor’s coattail, I would be cured. Silly to believe that of my doctor. But of Jesus? Jesus was and is more than just a man. His very being was and is power because he was and is God’s son. The word for Power, according to Strong’s, is not merely “power” as we would use the word to denote the electrical power that comes to our homes or the horsepower of the engines of our cars. Instead, it’s the Greek word dynamos; and it means miraculous power, might, and strength. The English word “dynamite” is derived from the Greek dynamos. 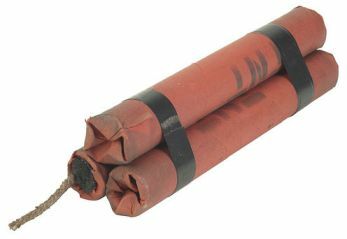 I imagine in the day when dynamite was first engineered the people must have felt it had some sort of miraculous power! That’s the kind of power that went out of Jesus and into the woman…but the story doesn’t stop there. It says that the woman could literally feel in her body where she was healed. That would be like me being able to feel the complete and total absence of all pain…being able to stand up without creaking hips…being able to straighten all the way up without feeling pulling and pain in my pelvic area…no abnormal bleeding or constant low back pains, all at once, without visiting a doctor or having surgery or doing anything except being certain that touching Jesus’ robe would transfer enough power — that elusive substance that worked miracles — into my body for complete healing. Wow. It makes me wish I lived back in the day when Jesus walked the streets! Wouldn’t you LOVE to hear Jesus tell you that your suffering is over? Why were these healing stories included in the Bible if not to encourage us? There are many modern-day examples of healings that had no medical explanation. There are also many people today who are healed of cancers and other diseases through the hands of modern doctors. I’ve touched Jesus’ metaphorical robe and have believed that he WILL heal me of ALL my suffering — emotional and physical. Yet I perceive through the twists and turns of my path thus far that the means by which He will heal me will be through medical science. So the way I touch Jesus’ robe today is in believing that He will supernaturally — dynamos — guide the surgeon’s hands. This will not be another dead end for me. This surgery will be the Lord’s way of healing me through the hands — and prayers — of my medical team. I asked for a doctor who shared my faith…he led me to one. I told Him in prayer that if I knew for sure that I had adenomyosis, I would have surgery…then he allowed the disease to show up on a sonogram when it had not shown up before. Kind of…dynamite…how I’ve been led, isn’t it? Next Next post: Hold me?